Woodpeckers was established in September of 1988. Their focus has always been top of the line woodworking tools. Since 1993 Woodpeckers has manufactured superior router tables and router mounting plates. They also manufacture router lifts, router fences, measuring and layout tools, and many useful accessories. All of Woodpecker Tools are manufactured right here in the USA. They do their own machining, engraving, assembly, and packing to insure that your order is quality made and promptly delivered. 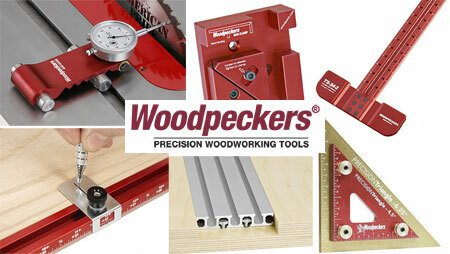 Woodpeckers is proud to make truly American made Router tools and accessories. The innovation, quality, and careful engineering that goes in to manufacturing Woodpecker tools is what makes these tools the best in the industry. We carry the full line of Woodpecker Tools at the lowest price. If you find a Woodpecker tool at a lower price, then we'll match it. Looking for Woodpecker box clamps? We carry the full line of Woodpecker tools, including the woodpecker box clamps that were recently features on DIY network. Shop for Woodpecker box clamps and other great tools.